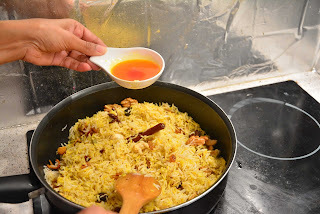 The Paris Feast: Zafrani Pulao (Saffron Rice) for that special dinner. A few recipes back there was a post on the Chicken Pulao (click here). 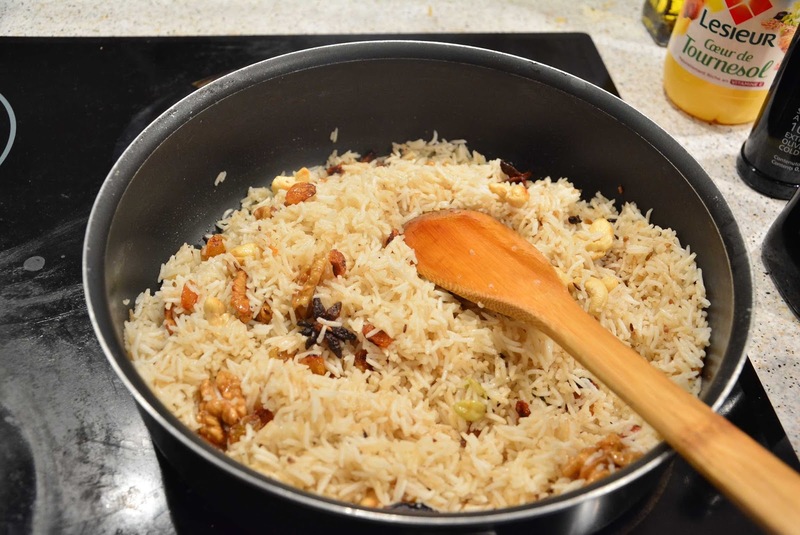 Pulao is a rice dish which is common in many South and Central Asian cuisines and has the same roots as the Pilaf, the latter being more popular in Central Asia. As I mentioned in that previous post and I will re-quote it here. 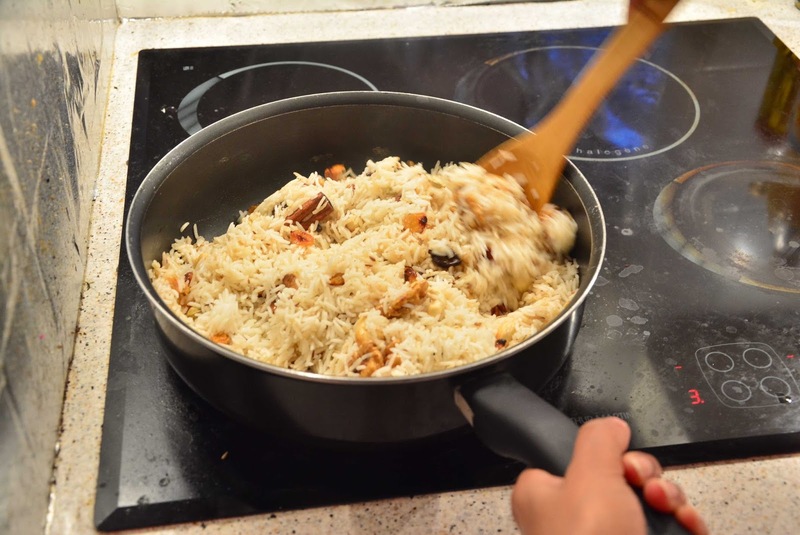 “There are numerous ways of cooking Pulao, and no particular traditional form, neither is there any particular ingredient for the pulao.” Though the word Pulao is believed to have a Sanskrit root and means cooking rice and meat together, over the centuries many vegetarian versions have evolved. 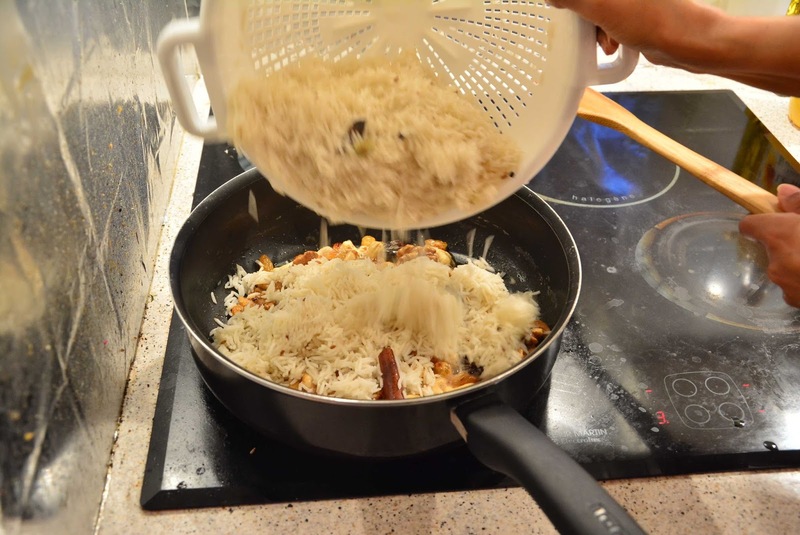 One of the most popular vegetarian versions of the pulao is the Zafrani Pulao. 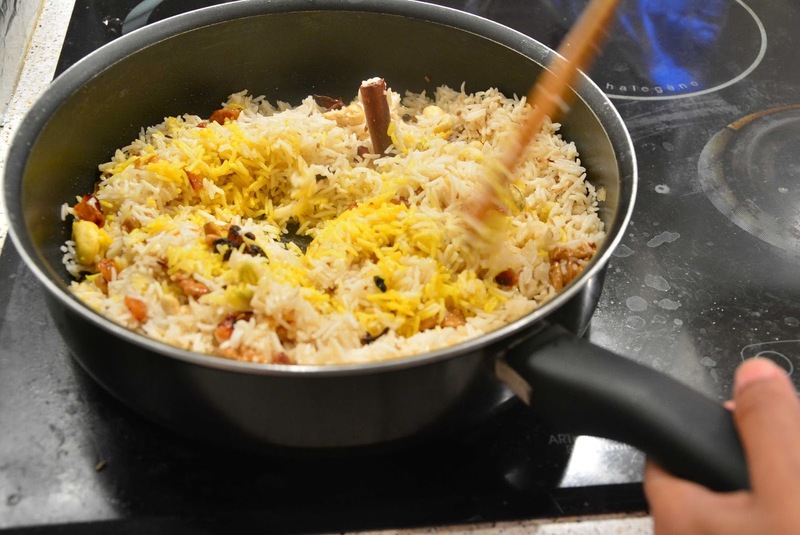 Zafrani Pulao simply means Saffron Rice and like most other pulao versions it consists of rice cooked with saffron. 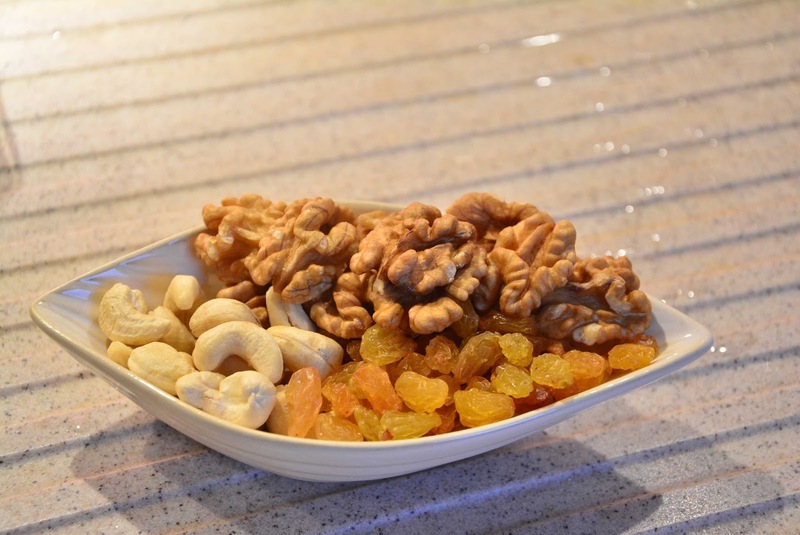 In addition, dry fruits are added to the pulao which gives the dish its taste, aroma and luxury. 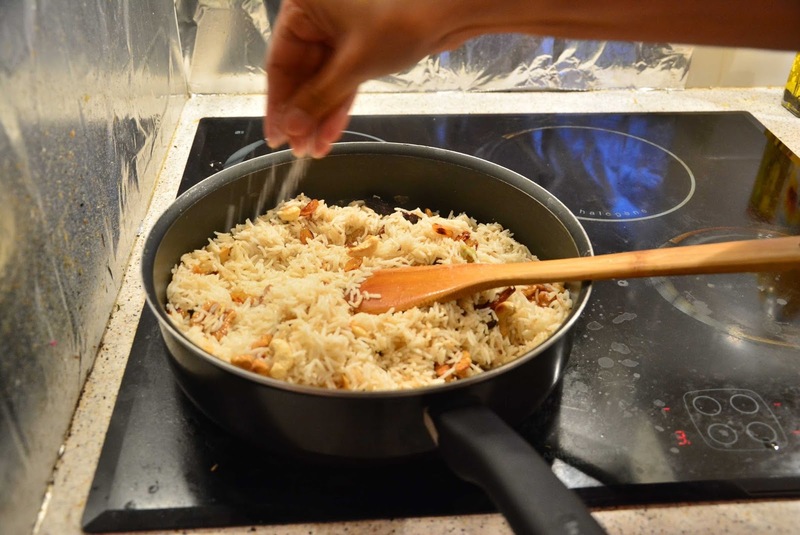 The main ingredient is basmati rice which is a long, slender-grained aromatic rice originating from the Indian subcontinent. 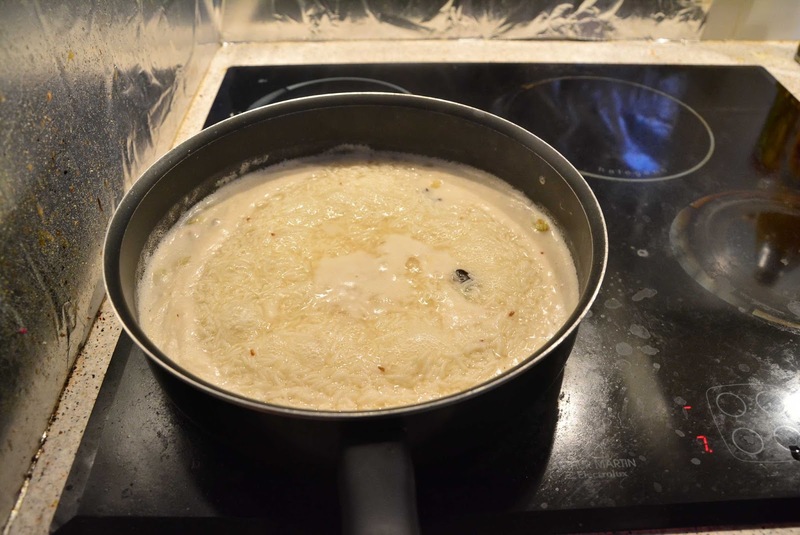 Conventional recipes use clarified butter (known as ghee in Indian cuisine). 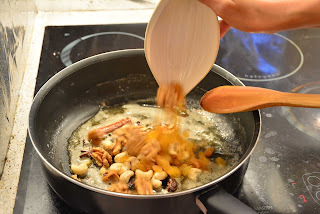 However for my version I replaced the ghee with butter which is less calorific (there are already dry fruits such as cashew nut and walnuts, so it is better to cut off the calories wherever possible). Trust me, this change does not affect much and this version of the zafrani pulao is as delicious and extravagant as the more calorific conventional versions. I must also give a small anecdote for my preparing this special dish. 21st August happens to be Mitra’s birthday and to reciprocate his preparing the chocolate-rum-raisins muffins and cakes for my birthday (click here for the recipe) I had to come up with something special for him. After all he is just the apprentice in cooking, while I happen to be the chef in our house. This is why I came up with this epicurean, sumptuous and delicious delicacy. 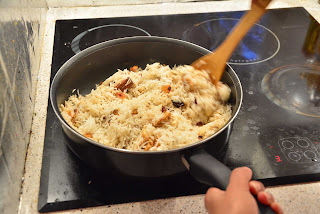 So here is the recipe of the Zafrani Pulao with generous portions of dry fruits and saffron. Wash the rice well at least 3 times until the water runs clear, then take it in a deep bottomed pan with water double the quantity of rice. Add half of the whole spices (cinnamon : 1 stick, green cardamom: 5, brown cardamom : 2, star anise : 1, whole cumin seeds : 1/2 teaspoon, mace :1) to the rice. Add sunflower oil to the rice. Wait for the rice to be cooked. Be careful not to overcook it, the grains should be well separate. 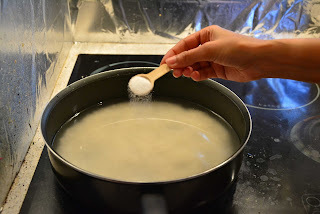 Add about 15 grams of butter to the rice and fluff the rice with a fork so that the rice gets well coated with butter. 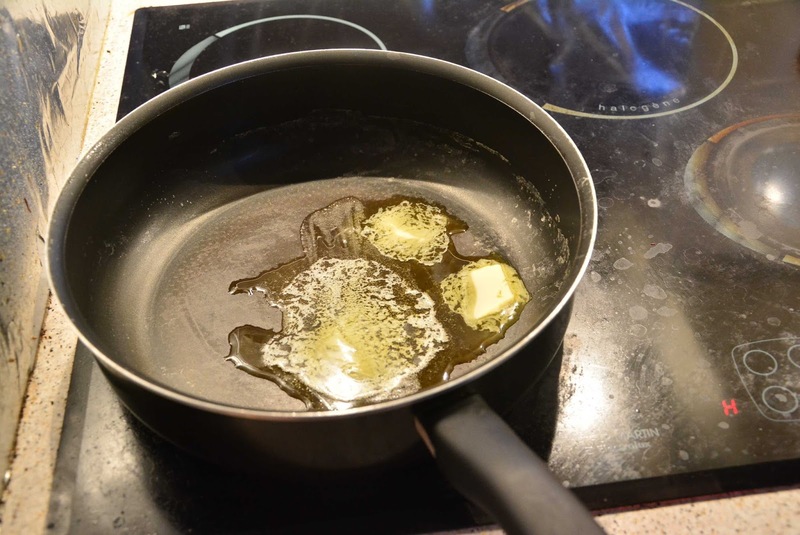 Take 15 grams of butter in a pan. 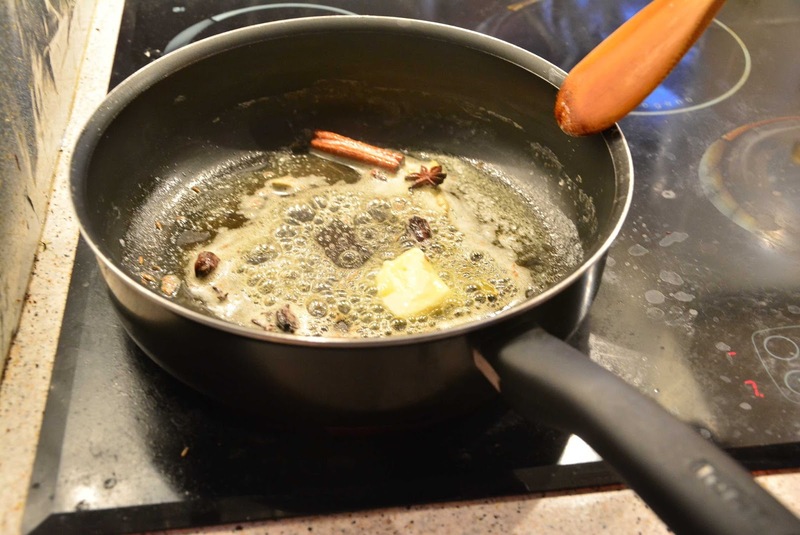 Add the remaining whole spices to the butter. Add another knob of butter (around 10 grams) to the whole spices and stir well. 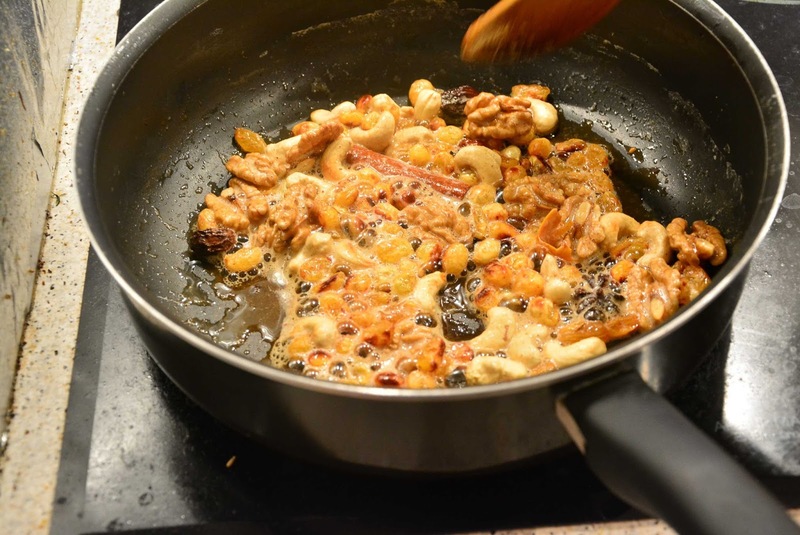 Add the dry fruits to the pan and saute it nicely. 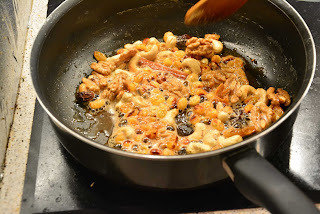 The cashew will turn golden and the raisins will swell a bit. You can use this picture for reference. Then add the rice to the pan. 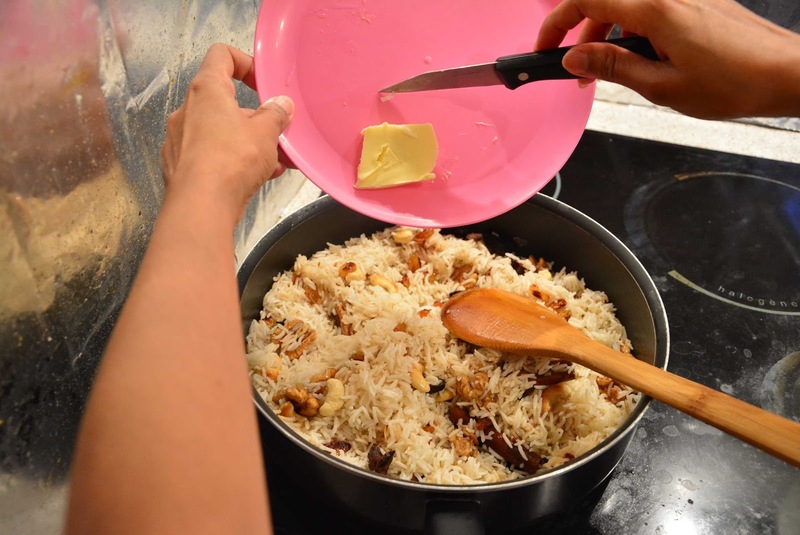 Shuffle the rice well to coat it with the butter mixture. Add the remaining butter (around 20 grams) to the rice. Add a bit of salt. Shuffle well again. At this stage the rice will look like this. 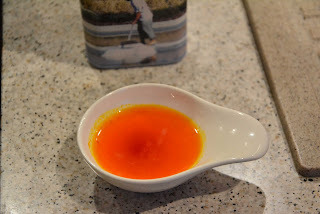 Prepare the saffron mixture. 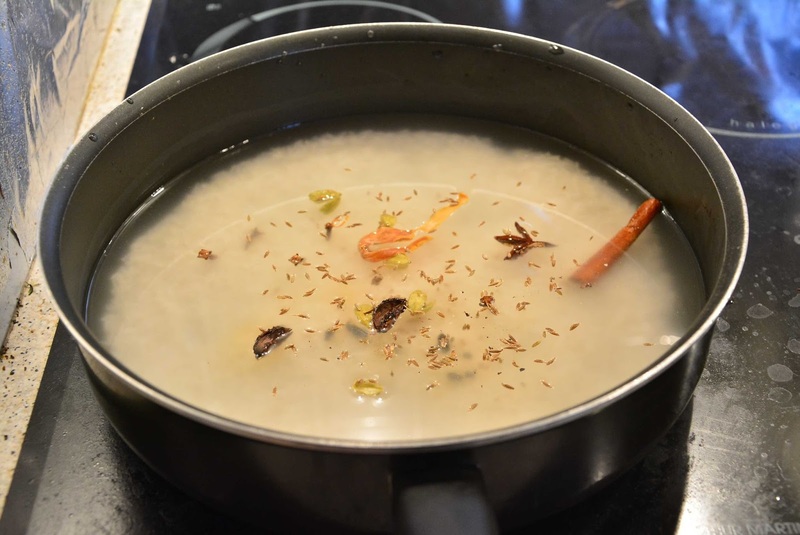 Add one dose of Ducros powdered saffron in lukewarm water. Pour the saffron on the rice. Add the second dose of saffron and repeat the shuffling. Add 2 teaspoons of rose water (optional) and shuffle well. Cover the pan with an aluminum foil and cook it in low heat for around 5 minutes. 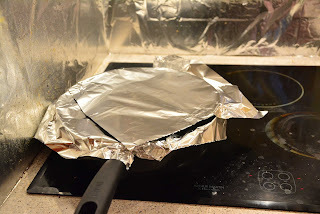 Remove it from the heat and let it sit for 10 minutes and then serve. 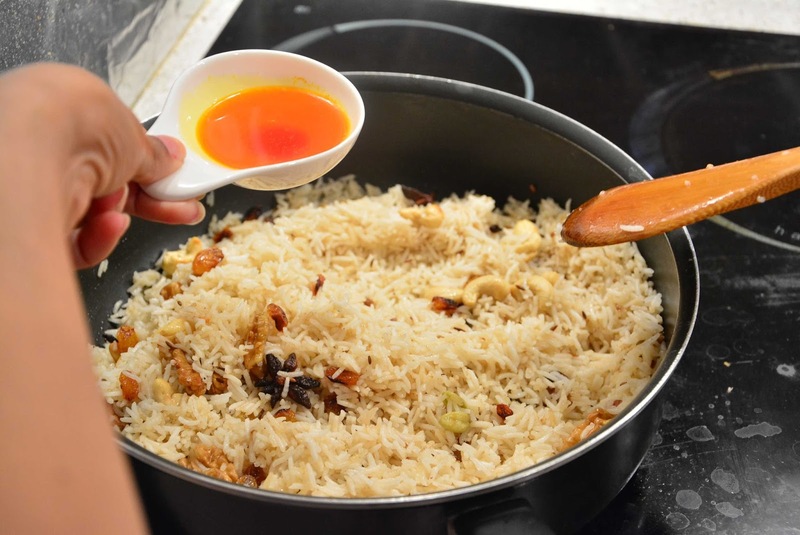 Zafrani Pulao simply means Saffron Rice and like most other pulao versions it consists of rice cooked with saffron. 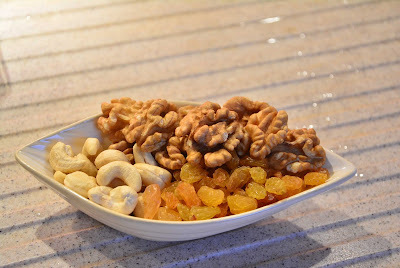 In addition, dry fruits are added to the pulao which gives the dish its taste, aroma and luxury. 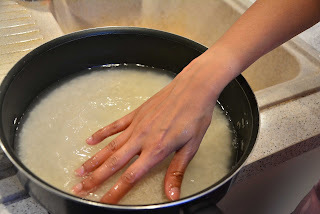 Wash the rice well so that the water runs clear, then take it in a deep bottomed pan with water double the quantity of rice. 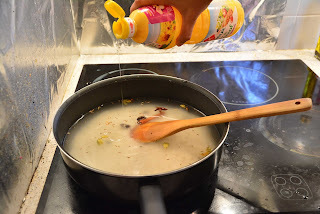 Add salt and sunflower oil to the rice. 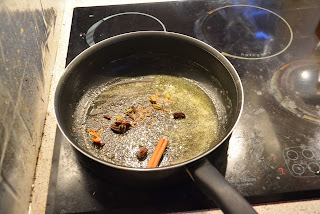 Add half of the whole spices (cinnamon : 1 stick, green cardamom: 5, brown cardamom : 2, star anise : 1, whole cumin seeds : 1/2 teaspoon, mace :1) to the rice. Strain the rice. 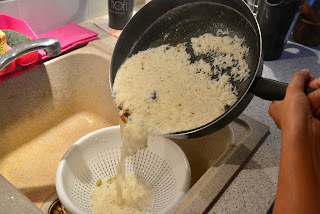 Add about 15 grams of butter to the rice and fluff the rice with a fork so that the rice gets well coated with butter. Take 15 grams of butter in a pan. Add the remaining whole spices to the butter. Then add the rice to the pan. 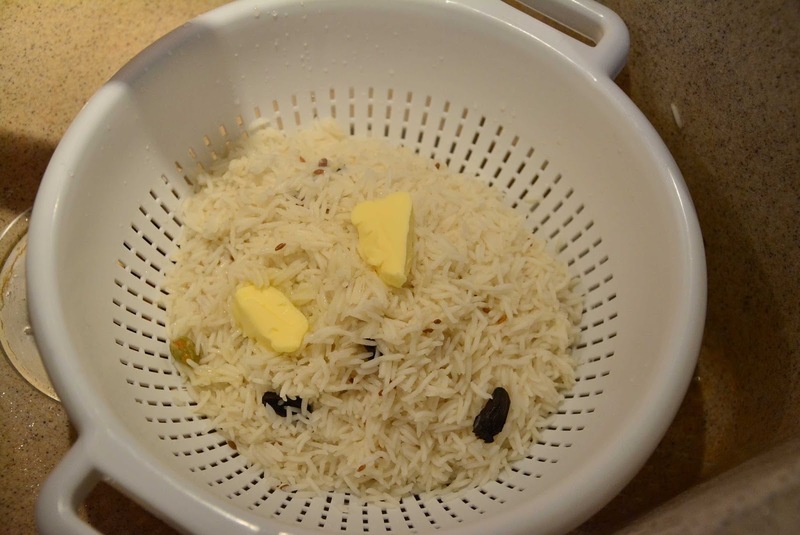 Shuffle the rice well to coat it with the butter mixture. Add the remaining butter (around 20 grams) to the rice. Add a bit of salt. Shuffle well again. Pour the saffron on the rice. Shuffle it nicely. Add 3 teaspoons of rose water (optional) and shuffle well. It's look awesome. Confident it's taste was awesome too.